This is the result of social media and smart phone's recording things. Many years ago (before smart phones and social media), I witnessed a similar incident that was never captured on phones or catapulted into "world wide news", via social media. A flight from Las Vegas to Los Angeles that was fully booked. The carriers terms of carriage clearly stated that unless you checked in twenty minutes before departure, your reservation is voided and your seat could be given to a standby passenger if need be. I was in the boarding bridge as an angry man came tearing through yelling and pushing his way onto the airplane. Turned out that he showed up just five minutes before departure and the agent had already given his seat away to a standby. He was clearly irritated when he showed up for check-in (maybe lost at the casino tables 555). And he made a big fuss demanding he be given "his" seat! The agent told him he would be put on the next flight that would be departing in approximately :45 minutes. No good...the guy started ranting and running down the boarding ramp, pushing and shoving other passengers out of the way, as he forced his way into the airplane. Airport Security was notified and showed up almost immediately. That is, a LV Metro Police squad car pulled up on the ramp to the jetway stairs, and two officers vaulted up the external steel stairway and entered the airplane. When they confronted the angry passenger, he refused to deplane and began hurling insults at them. 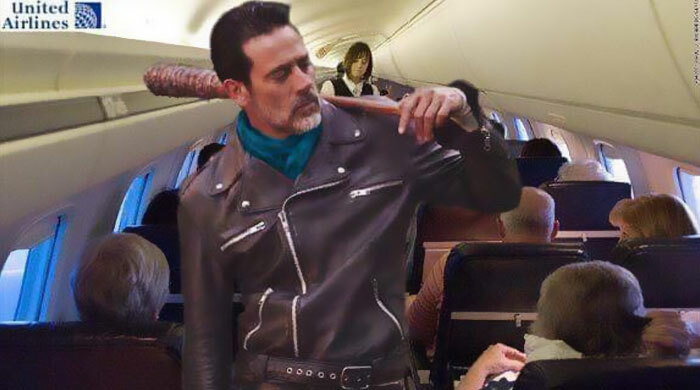 It seemed like it took them around 3 or 4 seconds, maybe, to subdue the guy and start removing him from the airplane. As I recall, there was never even a mention of it on the local news. Last edited by Pablo; 12th April 2017 at 16:42. I'd rather say this is the result of overbooking in stead of social media. But I understand the laws in the US are different of those in the EU, where you have more rights and better protection as a passenger. Yes of course, everything in the EU is better than in the Great Satan. Not everything, but some things, like protection of clients and custommers. In this case, it is not the fault of late check in or stand bye passengers, but of the ground staff of United and crew center. Didn't they know before that 4 crew members needed a flight to be ready for another plane? Don't they have a planning and reserve seats before? It was a flight THEY OPPERATED. So everybody boards the plane and then somebody says "hold on, we have 4 crewmembers for another flight who have to get on this flight. No problem, we'll throw a few paying passengers of this plane. I think they have approved vastly onboard and have no complaints of service.........I actually think they are quite good in-flight with usually new planes. But it's everything before that is horrendous. And this is a clear case of them not giving one fcuk about customers. The staff had to be in Louisville the next day.......it's a 4hr car ride, likely less. Last edited by marc26; 12th April 2017 at 20:31. My best guess is that the adding of 4 crew members on a "must go" basis, probably occurred as a spur of the moment thing. Normally, as you say, the airline blocks out seats for such purpose. It's hard to believe that they couldn't auction off some "denied boarding" cash and goodies, to entice four passengers to voluntarily deplane? Whatever, It was handled very poorly and has become a massive PR nightmare for United...as it probably should! I see where thousands of Chinese are blogging about the incident and calling it racist, because the "manhandled" passenger was Vietnamese-american. Also calling for a boycott of United flights in and out of China. This is the kind of stuff I referred to when I said "social media and smart phones". And if the other passengers hadn't filmed and sent the story out, probably much less of a story. Although, it's not everyday that an airline passenger gets beaten up at the hands of the airline and security personnel. There are probably union contracts that prohibit transporting crews with ground transportation (long distance). There were, when I was working. My company even demanded and payed for "exclusive" hotel shuttle vans for crew members on layover, for quite a while. I mean, there were no "civilians" allowed on the shuttle vans taking the crews to and from their hotels. This, because of an accident that occurred when some drunken passenger started interfering with the driver. Crew members were injured, and the Company said NO More! I don't think that it's their "preference" to refuse any paying passengers? Captain and Pablo like this. This won't cost them any money beyond the lawsuit which is peanuts for them. yes....I should have said it lost close to $1BN "at one stage" on Tuesday's trading.. Earlier in the day, United Continental Holdings(UAL)' stock was off about 4%, knocking off close to $1 billion off the company's market value. By late afternoon, after a mea culpa from the CEO, the stock had recovered from the worst losses -- but its market value was still off by $250 million. It really was disgraceful, supposedly the 4 seats required were for United crew on their way to service another flight. Personally I would have jumped at the 800 dollars on offer and am quite surprised they couldn't find 4 people willing to delay their flight for that. Fault lies entirely with United, if the flight was overbooked then they should have never been allowed to board in the first place, big difference between blocking someone from boarding and giving them some compensation as well as getting them on the next flight etc and physically removing someone who is not being violent from his seat. Their CEO has changed his tune and is now into a major damage limitation exercise but the passenger in question is now assembling a team of lawyers who will probably get more than 800 dollars compensation! They were pulling people off flights before even offering the max they are allowed to!